The motor or an electrical motor is a device used in most electronic motion control systems as one key element. The electric motor can convert electrical energy to mechanical energy. Because of motors, life is easy. They can be classified by the source of electric power, their internal construction, and their application or by the type of motion. 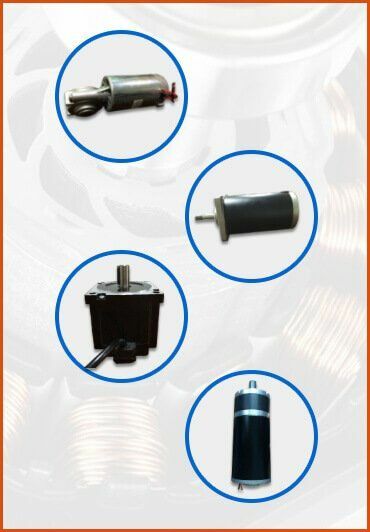 Technically, you can classify an electric motor as AC motor, DC motor and Universal motor. As one electric motors manufacturer, we offer electric motor in different sizes and types to fit into multiple requirements. A linear actuator is a device that converts rotational motion into linear motion. It is an essential part of motion control systems. As electric linear actuator manufacturers, we aim to supply simple, but efficient linear actuators with improved product functionality. To choose a best linear actuator for your industry and machine, browse through our products available in different shapes and sizes. Gearboxes are the core components used in almost all types of industries including manufacturing and automation. They are gearing transmission components integrated into boxed shells. Gearbox can increase or reduce the motor speed, change the direction of transmission and torque. In Motion control systems fields, there are 5 common types of gear: spur gear, helical gear, worm gear, planetary gear, bevel gear. By masteries, there are plastic gears and metal gears. As gear configuration decides gearbox type. You can find the 5 common gearbox types: worm gearbox, planetary gearbox, coaxial helical inline gearbox, bevel helical gearbox, spur gearbox. Screw Jack and slew drive are other motion control products as worm drive gearbox. We are a leading gearbox manufacturer supplying a large selection of industrial gearboxes to meet your specific requirements and applications. Once the client has approved the final design, we will start the sample production. Why Choose POWER JACK MOTION? With more than a decade’s experience in designing and manufacturing motion control products, we can understand our client’s requirements and provide them with tailor-made solutions. As we are China-based, we have the best raw material resources at our disposal. Our costs are 40% cheaper compared to manufacturers in any other country. In other words, importers often make more money by sourcing from us. Our competitive prices can open new market opportunities for our clients. With our extensive manufacturing experience behind us, we have developed core in-house technology that can satisfy our client’s quality demands. Countless customers have said that our products are as good as Taiwan-manufactured products. We have a strong R and D team with extensive designing experience. Our team not only offers standard products, but also provides OEM services and customized products as per your specific requirements. We have the resources to manufacture large quantities of standard series products in a short period of time. Our mass production line assures both, quality and quantity. We provide prompt delivery of products as per agreed schedule. We stick with one thing and do our best, that’s our motto. We keep our promises no matter what happens. Good customer feedback and satisfaction helps us improve our services and products. It’s a win-win situation for all parties involved. We are a leading global solar tracker actuator manufacturer. I was searching for a new solution for our agricultural equipment. During my online search, I came across a promising company, Power Jack Motion. After working together for several years, we are impressed by their professional service and products. It would be a pleasure for up to continue this prolific relationship with a professional gear manufacturer such as Power Jack Motion. We trust them completely.